Tonight was the first night in a L-O-N-G time that we have all sat down together at the normal dinner time to eat something home cooked by me. How long is softball season again? I made my easy version of lasagna. Boil some rotini pasta, a little less than the box says. Drain. Throw in a casserole dish. Add italian sausage(already browned), your favorite spaghetti sauce (mine was home made today), and mix together. 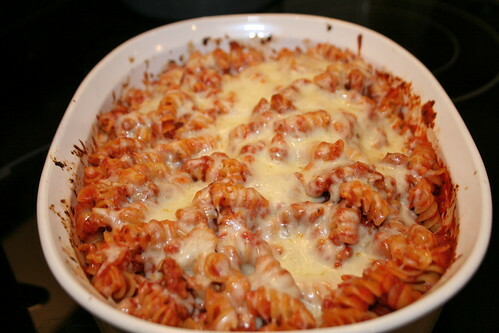 Top with cheese, mozzarella or I like the Italian blend by Kraft. Bake in 400 degree oven until cheese is melted, about 10 minutes. So easy and so tasty. There was hardly any left. I guess the kids have been starving for a while. Yum. Do you have some leftovers? Not any more. The kids finished it off for lunch. Now I'll have to come up with something for tonight.